The Cuisinart 630-20 chef's classic 11" square griddle features thick, hard-anodized aluminum construction which conducts heat evenly and efficiently through the sides as well as the base, ideal for gentle simmering and the wide shape speeds up the reduction of sauces. The 630-20 features Quantanium and nonstick cooking surface which is reinforced with titanium for lasting food release, healthy cooking and easy cleanup. The Solid stainless steel riveted handle offers perfect balance to provide exceptional control. Tapered rim make pouring and draining drip-free and simple. The 11in Square Griddle Non-Stick Hard Anodized has many exciting features for users of all types. You can extend the lifetime of your 11in Square Griddle Non-Stick Hard Anodized with the purchase of a FactoryOutletStore Factory Protection Plan. See the 11in Square Griddle Non-Stick Hard Anodized gallery images above for more product views. 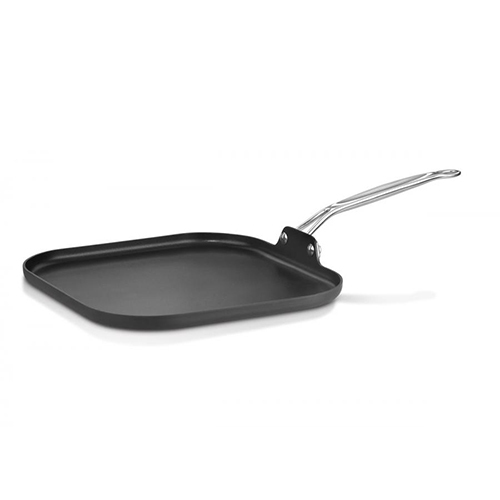 The 11in Square Griddle Non-Stick Hard Anodized is sold as a Brand New Unopened Item.